So here we are in the furthest north-western outreaches of the county, where the towns and villages look towards Cambridge and Ely more than they do to Ipswich or Bury. Mildenhall is Suffolk's biggest parish, covering almost 2% of the entire county surface area. Not a lot of people know that. It includes at least five distinct settlements, the largest of which is Mildenhall High Town. Less than a third of the population of the parish live in the town, so it is an important reminder to family history hunters in particular to remember the difference between a parish and its main town or village. Other settlements in the parish include West Row, where the famous Fen Tigers speedway stadium is, Beck Row, Holywell Row and Kenny Hill. However, Barton Mills, which forms a pleasant southern suburb to the town, is actually a separate parish. Housing estates sprawl along the roads which encircle the air base. The town centre itself is tiny, and might once have been pretty. Unfortunately, half a century of occupation by the American Air Force have overwhelmed the parish and rather worn the town down, although there have been great efforts in the last couple of years to improve things, and the area around the bus station bears testimony to this. 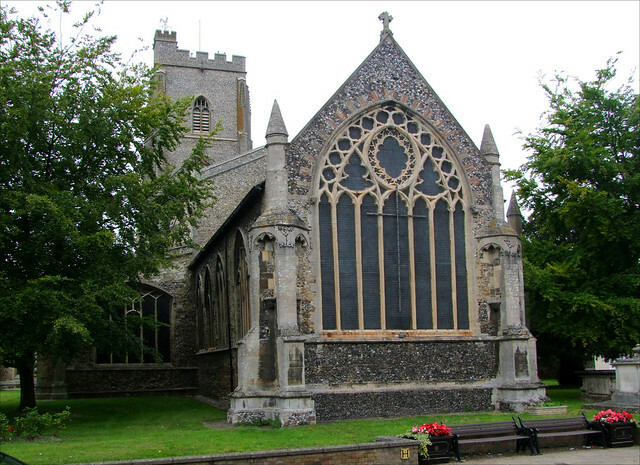 Perhaps because of the rather low key nature of the town centre, St Mary dominates its surrounding settlement like no other church in Suffolk does. You can't help but be struck by the sheer immenseness of the building. It is the biggest church in Suffolk, almost 60m long and 20m wide, with a tower 40m high. Virtually all of it is original, hardly anything of it is a Victorian extension. It is a church of superlatives; the 14th century west window is considered one of England's best, the roof the finest in East Anglia. The church contains Britain's biggest Royal Arms, and you enter through one of the biggest church porches in England - and you will be able to do this, because the church is open all day, every day. The fact that this magnificent pile is in the middle of a fairly scruffy little town only accentuates its glory. But perhaps it is also that which makes it seem curiously aloof. What you see is largely a rebuild of the mid-15th century, in common with the other great Suffolk churches. What makes Mildenhall special is that the Decorated chancel survives from an earlier building, its flowery east window a reminder of how mystical we all were before the Black Death turned us serious. However, it is deficient of the chancel aisles you often find elsewhere in churches of this size. The tower was completed in the 1460s, apart from the stair turret which rises above the battlements, an unfortunate Victorian addition. If you look up at the tower as darkness falls you will see that there is an aircraft warning beacon up there, a necessary feature on this, the only high building in the parish. Beside the south side stands the medieval charnel house. This was a necessary feature of any medieval town church with a small graveyard; after thirty years or so, corpses would be exhumed and placed in the underground vault, to make room for more burials in the churchyard. The charnel house had its own chantry priest, who said Masses for the souls of the dead. Charnel houses, along chantry priests, fell into disuse after the Reformation, when there was no longer a theological imperative for their use. In fact, the remains of this one were 'gothicised' in the 19th century to make a picturesque ruin. Another one survives in Bury St Edmunds from the lost church of St Margaret. The south porch is pretty much Victorian, but in any case it is the north porch which is outstanding. Many Suffolk porches have an upper room, but none are as commodious as this one. It formed a chapel to the Blessed Virgin before the Reformation and was later the town school. The vaulted ceiling of the porchway is of a size and quality seen rarely elsewhere in Suffolk. It is bigger than many transepts. Indeed, I have been in smaller churches than this porch. But the south porch should not distract us from the fine west doorway. You can't help thinking that it was intended to be used as the main entrance. Once you are inside, however, all thoughts of the outside will driven from you by the sheer vastness of the interior. It is tempting to turn your attention immediately eastwards or upwards, but if you turn west and go through the curtains into the space beneath the gallery you will discover a wonderful vaulted ceiling here as well. The two lancet glasses here are probably the best kept secret of the building. They are beautiful, I think. In the gallery above hangs what is claimed to be the largest Royal Arms in England. It is certainly very big, and must have created quite an impression when it was suspended above the chancel arch. You come to Mildenhall to see the roofs. The most spectacular is the nave roof, but the two aisles are even more interesting and rewarding of time and binoculars. Mildenhall's nave angels are restored, although not as heavily as those at Woolpit. Somone was paid a shilling a day to destroy them in the 1650s, but they have suffered less from iconoclasm than from 18th century churchwardens firing into the air to disperse jackdaws. They are not beautiful like those at Blythburgh, but they are certainly magnificent. But the aisle roofs are the best in England. The north aisle is the better of the two.The massive hammerbeams are carved with the most extraordinary figures, and you can't help thinking that they don't need to be so big. You're right - in fact, they don't need to be there at all. Both aisle roofs are supported by their own weight on the arcades, and all the hammer beams are false. It did occur to me to wonder for a moment if they had been made originally for a quite different church, and used here instead. Most of the hammer beams feature prone figures with grotesque faces, all of them rather startling. The beams may distract you from the carvings on the spandrels, which are exquisite. My favourites are the Annunciation, the adoration of the shepherds, and St Michael with his dragon. All the furnishings are modern, and were given by Munro Cautley in memory of his wife. He designed them, and to be honest they aren't bad. Like a lot of his work, they have a flavour of 1930s cinema architecture about them, despite dating from the 1950s, but the carved figures on the bench ends at the far west are super, with St Etheldreda of Ely on one side, and the Blessed Virgin on the other. The font isn't strikingly beautiful, but it does include the arms of Sir Henry Barton, Lord Mayor of London, whose tomb is at the west end of the south aisle. Sam Mortlock thought he might have been the major donor for the rebuilding of the church. Incidentally, it is worth recording that Mr Mortlock was a choirboy here in the 1930s, and his enthusiasm for the building shines through. There are a couple of significant memorials, one of which is at the eastern end of the south aisle. This is early 17th century, and commemorates Sir Henry North, Lord of the Manor. I was disappointed to discover from Mortlock that the weeping figures are 19th century replacements. The Norths were still around after the Commonwealth, and not in a terribly good mood; Sarah North, wife of Henry Jr, has a memorial beside the chancel arch on which her husband records in Latin that he is Dead while living, oh how hard; you are happy because your life has ended, I am desolate because I cannot die. He wrote the gloomy sequence Eroclea or the Mayd of Honour, and then promptly killed himself. Puts a bit of a downer on the thing, don't you think? The rood screen now is very different from what must once have been here. The fact that there are two upper doorways to the original rood loft stairs suggests that it must have been a massive affair. The screen you see today is a 20th century replacement. Beside it is the memorial to Cautley and his wife, opposite the North memorials. The Cautleys are also commemorated (and buried) at Westerfield, across the county. It is easier to be grand in Perpendicular than it is in Decorated. Because of this, I think that the chancel is really rather splendid, and often overlooked except for the window. Mortlock calls our attention to a graveslab in Lombardic script in the sanctuary. It remembers Ricardus de Wichforde who made this new work. He it is we have to thank for the wonderful window tracery. To imagine it with its original glass is to recall and regret how much we have lost.